"The existence of "African Americans" with virtually no African ancestry and of "European Americans" with as much as half African ancestry "
The genes for colour are a very small portion of the African genome. It is possible to be visibly African with only a few genes. And vice versa. Would have liked to have seen the self-reported Native Americans. But I guess the reality of that situation is too much of a political hot potato. Personally I would rather know the truth than close my eyes on my true ancestors. On the whole the levels of NA in the dominant European population look pretty high to me. Quite a lot of folk clearly bred in and live on in their descendants. Interesting that South Dakota, a state named after a north American tribe is the only state with NO NAs in the dominant European population. Does that mean everyone in South Dakota with a trace of NA ancestry claims it? Were they obliterated? Or is sexual apartheid alive and well in South Dakota? In the US, the one drop rule held sway for several centuries. Both my parents are about 50% African and 50% European in ancestry (my mother is about 8% Native American). I have maternal ancestors who are ethnically black but appear phenotypically white. Race in America is a cultural construct with fuzzy boundaries. So I am not surprised by the vague overlap in identity. It is not an error in self-report, but part and parcel a consequence of the squirrelly definition of race on America. 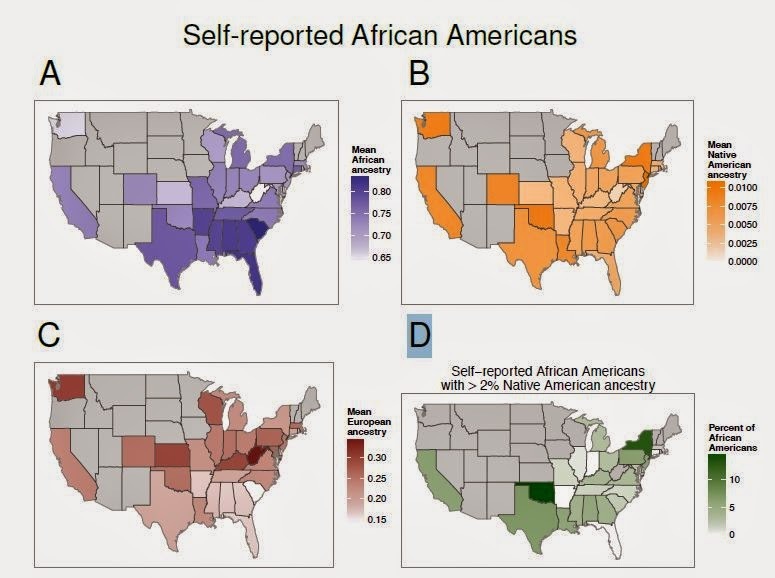 Approximately 1% of self-identified whites have more than 1/16th African ancestry. The Lion's share of African Americans have more than 50% African ancestry. Many people in the U.S. who have one black parent and one white parent no longer adhere to the "one drop rule" and identify instead as having more than one race on census forms. But, that was not a choice apparently, in this context. Many people with one black grandparent and three white grandparents who normally identify as mixed race, will say that they are white rather than black when forced to choose. 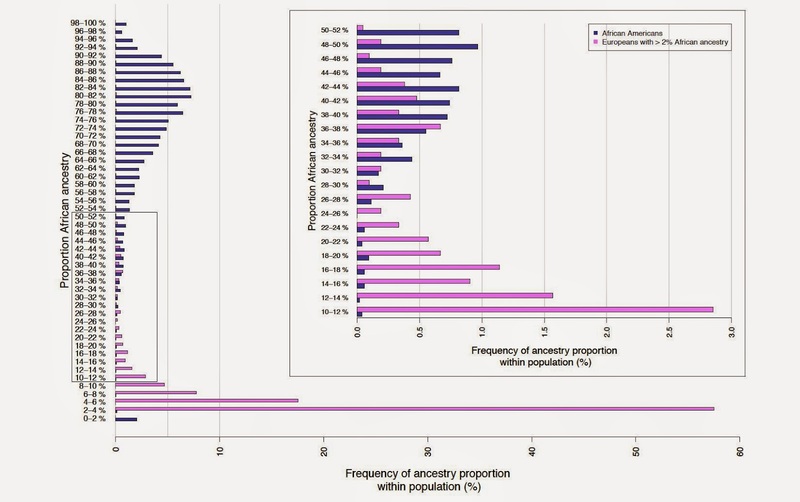 And, some who have one black parent and one white parent (a group that often identifies as mixed race on census forms) will choose white because they are aware (if they are ordering genetic tests for themselves) that most African-Americans are part-European, so that they are more European than African American, percentage-wise. Certainly, no one in either situation would be unaware of their African ancestry, although at less than one great-grandparent (with that great-grandparent having typical proportions of European admixture) someone might not know, or at least might "pass". I suspect that this threshold of "passing" also helps to explain the peak level of Neanderthal and Denisovan admixture in the populations that originally admixed which those archaic hominins, and that later dilution by unadmixed populations where archaic hominins were already gone explains currently lower levels of these kinds of admixture. "The existence of "African Americans" with virtually no African ancestry and of "European Americans" with as much as half African ancestry is probably due to either misreporting or some quite strange self-perception issues." It goes back to American attitudes on race. The belief was that "one drop" of non-European ancestry made you non-European. Also, skin colour is carried by a relatively small number of genes, so there you go. It's silly and ridiculous if you ask me. Re: Latino ancestry, keep in mind in the US Latino is a term used in addition to "race." So on the US census, one could self report as "Latino white" or "Latino black" or whatever. There's also a naming convention thing that might be skewing the results. In the Western US, "Hispanic" is more of a preferred term, though Hispanic also excludes people from Brazil and includes Iberians, whereas Latino includes Brazil and excludes Iberia. The numbers for Latinos in Lousiana are interesting. Must have something to do with the period between French rule and American rule when it was a Spanish colony I guess? 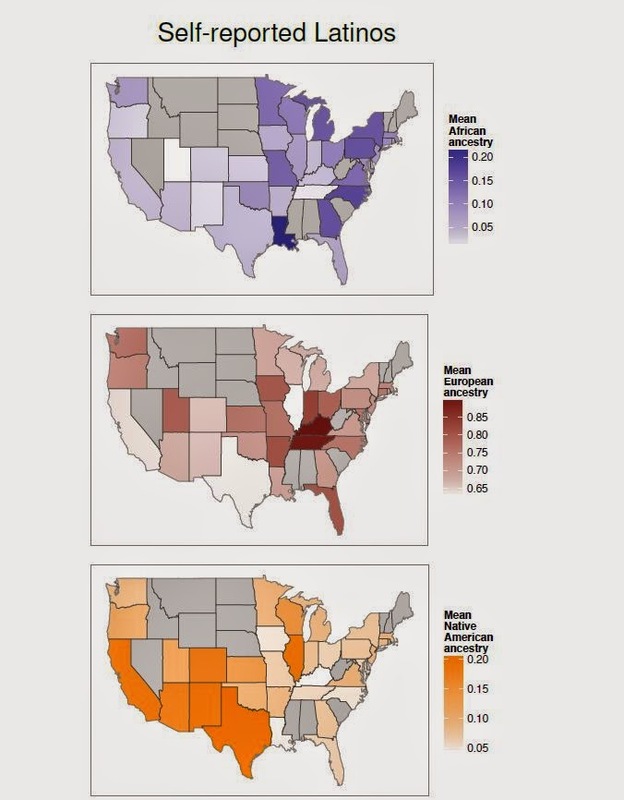 The thing I got out of this report is that European immigrants and stay home Europeans have less admixture than American Europeans, and did not contribute to the admixture levels of modern Americans. Not sure why Italy was left out and the "history" of European nations was rather naive and Colonial. African Americans with no African ancestry can be explained as an artefact of the methodology, which can be misleading. For example, the mtDNA of someone whose father's mother was African won't show any sign of African ancestry. Same with the Y DNA of someone whose mother's father was African. And nuclear DNA is of largely statistical significance, so not all that useful in precisely assessing the ancestry of an individual. As far as "Europeans" vs "African Americans" is concerned, there are a great many people with largely European ancestry who self-identify as African American simply because they carry certain "negroid" features, such as dark skin or frizzy hair, or simply due to the usual stereotyping. I have "African American" cousins whose father was Jewish and whose mother is almost certainly at least partly of European extraction. Yet they all self identify as African American. Indeed, This is what the data should be used for! Unfortunately, I am not so sure about 23andMe's European subgroups. I have traced all my ancestors back to at least the 18th century and some much further back and the very large majority of them are Dutch, with some minor German import. Still, 23andMe states that my ancestors are 31% British/Irish, 19% Scandinavian, 12,6% German/French and 37% "broadly Northern European". I suspect that the Dutch, not being recognised as a different group, are thrown in with the British and the Scandinavians (ao). This leads some even to conclude that the Dutch are actually from Britain (etc), while, historically, it is more likely that Dutch people moved to Britain than vice versa. 23andMe uses some odd divisions within the European section and the Middle Eastern and North African sections, but that is all due to their way of ascertaining ancestry back 500 years. The French and German group is bizarre to say the least. Every MDS plot I have seen shows that the French form their own cluster quite separate from the Germanic and Celtic super cluster. The division between Europeans, sub Saharan Africans and those Native Americans willing to be dna tested is more clear cut, less fuzzy and more reliable. Expecting an algorithm to distinguish between Northern Europeans like British, Irish, Dutch, German, Danes, Belgiums, Austrians and German Swiss is unrealistic. It is hard enough to distinguish a Scot from John O'Groats from some bog standard Russian living in eastern Siberia. To put it mildly, Northern Europeans are all very similar and differ more by language and culture than by their genetics. The strongest gene for African genome would be the "short nappy hair" type. U.S. Black American women for example shop for all sorts of weaves, wigs and get chemical treatments such as perms to hide away their hair. Biracials for example tend to have curly hair (sometimes wavy). The straighter the hair, the less black one is. The "one drop" rule was never universal in America. It's a real part of history and not a myth, but is usually overstated in its application. The data speaks for themselves but when one interjects commentary as 'misreporting or strange self perception issues" it is actually these types of edicts that have made "race' a dubious but legal US Constitutional construct embedded in law and process. A person who states he is "black' per US racial policy when his DNA shows higher "European" DNA attributes is only reflecting choice but it is obvious that the priviledge and status of "white" goes a long way so there is nothing negative about that subjective view of self. Having 10% of anything does not mean anything except as reported keeping in mind that genes are either recessive or dominant. It may be seen that when an alleged 'recessive" gene reaches (I am guessing and reaching here!) then at some point on a continuum, the corresponding phenotype will change accordingly. I am thinking of someone like Lolo Jones, where her running skills are indicative of nature, nuture, hard work while not possessing other attributes of her co-heritage makeup (being biracial) which personally is bogus but it works in USA. Why can't researchers acknowledge the territorial integrity of Africa as they do in Europe. They say Europe then state "sub Saharan Africa" as if it were some break away nation state having nothing to do with anything exept as a FEAR template acknowledging bias and ignorance while pretending otherwise. That can never be seen objective in scope and analyses! We say Sub Saharan Africans because North Africans are significantly different genetically. They genetically "Out of Africa" Mediterraneans. IMO possibly the oldest OoA mediterraneans. No insult intended. The Sahara was probably the most significant geographic barrier that ever existed in human evolution.